Brian J. Cole, MD, MBA. Dr. Brian Cole is a professor in the department of orthopedics with a conjoint appointment in the department of anatomy and cell biology at Rush University Medical Center in Chicago. He is the section head of the cartilage research program at Rush University Medical Center and the Cartilage Restoration Center at Rush, a multidisciplinary program specializing in the restoration of articular cartilage and meniscal deficiency. He also serves as the head of the orthopedic Master’s program and trains residents and fellows in sports medicine. Dr. Cole is the team physician for the Chicago Bulls basketball team, and co-team physician for the Chicago White Sox baseball team and DePaul University in Chicago. 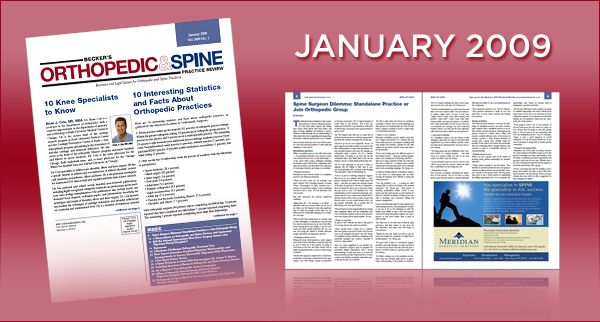 Here are 10 interesting statistics and facts about orthopedic practices, as gathered by the American Academy of Orthopaedic Surgeons. The dilemma between whether to start a standalone practice or join an orthopedic group is one that many spine surgeons face during their careers. Both options have their merits, and both can bring challenges and obstacles to success. Without careful planning and an understanding of what makes these choices appealing and unappealing, the decision could very quickly prove to be a mistake. Here, John Cherf, MD, MPH, MBA, one of the nation’s leading orthopedic surgeons, discusses his thoughts on purchasing orthopedic and spine devices and equipment in four areas. Will the Federal Government Shut Down Surgery Centers and Physician-Owned Hospitals? As the Democrats take control of the House, the Senate and the Presidency, many question the impact of such a change on ambulatory surgery centers (ASC) and physicianowned hospitals. The most significant question is: Will the federal government shut down and/or restrict physician-owned hospitals and ASCs? Don Love, the CEO of an orthopedic practice in Roanoke, Va., and Ken Austin, MD, an orthopedic surgeon in Ramsey, N.J., share their insights on key business challenges orthopedic physicians are currently facing. Five of the largest challenges facing orthopedic practices include (1) decreasing Medicare and Medicaid reimbursement; (2) decreasing third-party reimbursement; (3) difficulty recruiting physicians and staff; (4) increasing hospital competition and recruitment; and (5) the need to develop ancillary services and revenues. A new report examines the trends driving a shift in hospital-physician relationships and profiles the arrangements that can be adopted to secure successful, long-term alignment with the physician workforce. New technology in the spine market is expanding faster than the size of the universe. There are three main areas of focus. James B. Macon, MD, a neurosurgeon based in Framingham, Mass., who performs surgical procedures at several west suburban Boston hospitals and whose practice is dedicated to spine and pain surgery, discusses three new spine products which have benefited his practice. Here are brief profiles of six manufacturers’ that are among the world’s largest medical device companies; in addition, these six (listed alphabetically) are those from which orthopedic- driven ASCs and hospitals purchase much of their orthopedics-surgery related products. The Office of the Inspector General recently issued Advisory Opinion 08-08. This Advisory Opinion deals with a physician/ hospital joint-venture surgery center. Here, the Advisory Opinion was requested because certain physicians who invested in the joint-venture were themselves not “safe harbor” compliant. In essence, some of the physicians practice principally in an inpatient setting. The OIG, based on the number of prophylactic steps and the overall facts, determined that the joint venture would pose minimal risk of abuse under the Anti-Kickback Statute. Scott Becker, JD, CPA, and Melissa Szabad, JD, of McGuireWoods served as counsel to the requesting center. Tom Mills and Marion Goldberg of Winston and Strawn and Neal Goldstein of Much, Shelist were also instrumental in assisting the center to obtain the opinion.